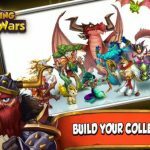 Card King: Dragon Wars is a game we’ve featured quite a lot recently, and with good reason. It’s gaining a lot of momentum as a new card battle game for the iOS platform (Android version still unavailable), and it comes with hundreds of different characters (or “creatures”) to collect, and a wide range of customization options for your creatures and your deck. It also boasts of high-end graphics you don’t see often in these types of games. 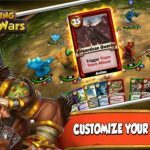 While we’ve already shared tips and tricks about several aspects of the game, this Card King: Dragon Wars strategy guide is all about getting comprehensive, and offering some tips that any player of the game can use, may they be newbies or experts. One of the first things you should do in Card King: Dragon Wars is to set your helper card. You should always go for the rarest card when choosing a helper, as this card will serve as a “sidekick” of sorts for other players. You want a card that’s leveled up as much as possible, and you want to also choose the rarest when picking another player’s card for your own. When you pick your own helper card, or if another player picks your rarest card as their helper, you’ll earn yourself some dragon fangs. When in battle, you should know which cards to use at what time. For example, you can go for support cards that provide a boost to attacks and play them together with an offensive card or drag attack – this could cause some significant damage to your opponent. Play support cards with splash cards and you can double down on the damage on your opponent’s cards, so to say – this holds especially true with blue magic splash cards. In Card King: Dragon Wars, Dragon Stones are the premium currency. Complete both types of missions (daily and global) and earn some free Dragon Stones upon completion, and once you’ve got five Dragon Stones to spend, use them for a shot at a Deep Creature Egg. This is a great way to get yourself some three- or four-star cards. You can also build a deck of cards based on color, and if you’re focusing on only one color, we suggest purple. It’s the color with a significant number of ability cards (e.g. poison or attack boosts as a result of abilities), and they don’t cost much magic. At the very least, make sure your deck has at least one purple creature represented. When forming a team, you can go for creatures of one color alone. And you don’t have to create a team where each fighter is of a different color. However, if you go for the former strategy, you can have a team consisting of red cards, and nothing but. This would be the most ideal setup if you’re more of a melee fighter. Red has the highest drag attack and the most attacking cards. Should you mix in another color, you can have a yellow and/or black card in there for buff and healing purposes. As you can collect an unreal amount of cards in Card King: Dragon Wars, you’ll end up with a whole lot of superfluous cards. Take the cards you don’t need or want and sacrifice them – that way, you can enhance your active cards in the process. Some cards you earn may look totally useless at first glance, but if you sacrifice them, they’d give a generous boost of experience to the card that’s being evolved, particularly if they’re of the same color. If you’ve got a card that’s fully leveled up, you can evolve it, provided you have the appropriate runes – that would make said card even rarer once it’s been evolved. You need coins in order to evolve a card, and as a bonus tip, you can also earn coins when completing daily and global missions, and especially when playing PvP. Remember that each of your creatures have five ability cards – you cannot switch those cards between characters, nor trade them. Yes, it is possible to trade fighters, but you should also take a good look at the ability cards, lest you give away someone who has some very useful and/or cool abilities. Want more Dragon Stones? If so, you can get them by asking friends to play the game, or asking them to redeem friend codes. 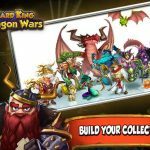 You can also install Card King: Dragon Wars on multiple devices, and redeem your own friend codes on the device you primarily use for gaming. And if you’re the social type of gamer, it never hurts to add strangers on Facebook for gaming purposes – provided they accept your invite to play Card King: Dragon Wars. Once you reach Rank 7, you can start taking part in the daily dungeons. Playing in here on weekdays could give you runes of a certain color, and playing on Saturdays would net you more free coins. Either way, you get some sweet rewards, so don’t forget to take advantage of these “dailies” when they become available. Don’t get the temptation to use your hero card as soon as possible, and when not needed after all. You’re better off holding on to your hero (card) in boss battles, and only playing it when the boss comes your way. If you were able to get more hero cards through the use of your other cards, you’ll get multiple hero cards, which you can then chain with support cards for a devastating effect. Here’s a simple thing to remember about dungeons – assuming there are three cards to fight, as shown on the preview page, there will be a total of three cards for three battles, or nine all in all. This makes it necessary to ensure your cards have a huge advantage over those you’ll be up against in the dungeon. If you get beaten, you’ll need to pay one Dragon Stone, so be sure you’ve got enough Dragon Stones before you enter.